Super Flip from Play'n GO is an interesting slot with a more traditional look and symbols, such as lucky charms, standard slot symbols, diamonds and stars. The overall design and layout remind of a classic slot, but the game has some interesting special features that make it stand out from the rest. You can win money with re-spins, wild substitutions and free spins with flipped reels. The variance of the slot is medium, and you will probably get regular winning combinations, but more often with smaller amounts rather than larger. This game is best played for a little while, at least until you trigger the free spins, as you can win most money there. The theoretical return to player is 96.53%, which is average for an online casino slot, and you can also play Super Flip mobile on the go, as the game is optimised for many mobile devices and can be found in mobile casinos. 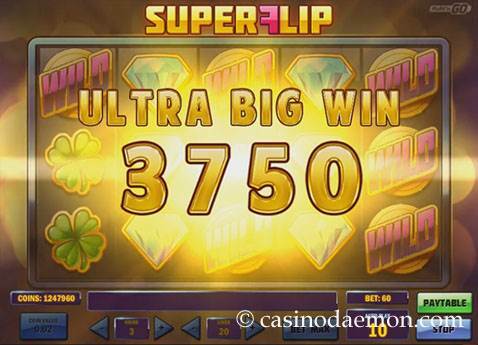 You can play Super Flip for free on this page and enjoy the game without any risk of losing real money. If you would like to try your luck for a real chance of winning some money you can play it at one of the online casinos listed on this page. The special symbol of this game includes a wild symbol that can stand in for other symbols to create winning combinations, but it does not replace the scatter symbol. You can get a re-spin of the middle reel if the first and second reel will show the same symbol, including wild symbols, and only if you did not get a winning combination. It is basically a second chance to achieve a winning combination. 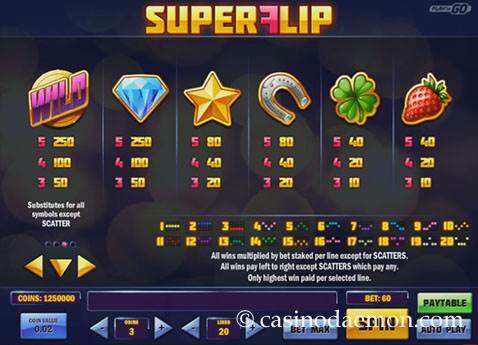 The Super Flip symbol triggers 15 free spins when you get it at least three times anywhere on the screen. 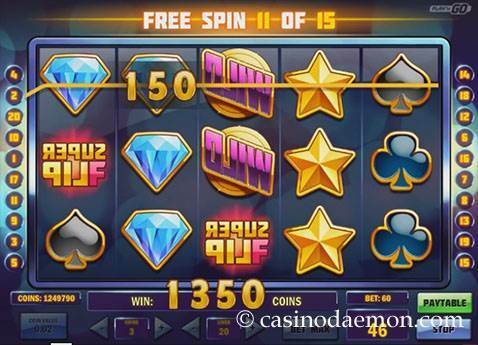 You can re-trigger the free spins up to a total of 90 rounds when you get additional scatter symbols, but what makes them really interesting is that the reels are flipped and higher paying symbols will appear more often. 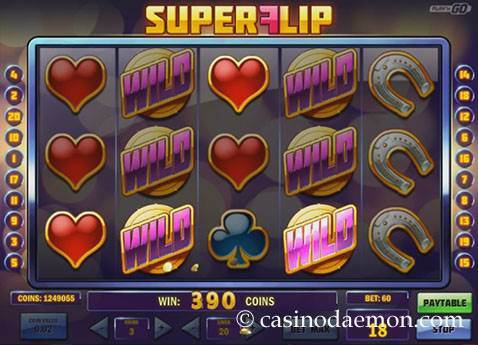 The Super Flip slot has 5 reels with 20 variable pay-lines. You can play the slot with coin values of between 0.01 up to 1 £/$/€, and bet up to 5 coins per line. The minimum bet in a spin is 0.01 £/$/€ for one activated pay-line, 0.20 £/$/€ for all activated lines and you can play a maximum of 100 £/$/€ per spin. It is also possible to select automatic play options.